This Policy was updated July 29, 2015 and applies to all 2019 Science Olympiad Rules in Divisions B & C. Please make a note of the classification of Categories A, B and C.
Purpose: This policy provides details regarding EYE PROTECTION in those events where an Event Rule requires Eye Protection. The objective is to choose the type of protection specific to the task. Competitor/Coach Responsibilities: Competitors are responsible for providing their own protective eyewear. Science Olympiad is unable to determine the degree of hazard presented by equipment, materials and devices brought by the teams. Coaches must ensure the eye protection competitors bring is adequate for the hazard. 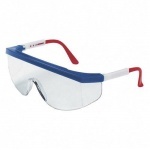 All protective eyewear must bear the manufacturer's mark Z87. Teams without adequate eye protection must be given a chance to obtain eye protection if their assigned time permits. Teams must not be allowed to compete without adequate eye protection. This is non-negotiable. Corresponding Standards: Protective eyewear used in Science Olympiad must be manufactured to meet the American National Standards Institute (ANSI) standard applicable at its time of manufacture. The current standard is ANSI/ISEA Z87.1-2015. Competitors, coaches and event supervisors are not required to acquire a copy of the standard. The information in this document is sufficient to comply with current standards. Water is not a hazardous liquid and its use does not require protective eyewear unless it is under pressure or substances that create a hazard are added. In order to meet the requirements of Category A eye protection, safety spectacles must provide basic particle protection. Examples include safety glasses, safety spectacles with side shields, and particle protection goggles. To meet the requirements of Category C eye protection, safety spectacles must provide indirect vent chemical/splash protection. They must seal tightly to the face completely around the eyes. Indirect vents must be constructed in a way so that there is no direct path for foreign matter to enter the eyes. In order to fulfill the criteria of Category B eye protection, safety spectacles must provide protection from high inertia particle hazard (often referred to as high impact protection). As such, they must bear the "Z87+" marking. Face shields/visors are secondary protective devices and are not approved in lieu of the primary eye protection devices below regardless of the type of vents they have. Prescription Glasses containing safety glass should not be confused with safety spectacles. "Safety glass" indicates the glass is made to minimize shattering when it breaks. Unless these glasses bear the Z87 mark they are not approved for use. 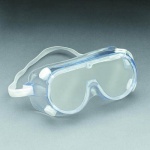 Categories A, B and C: High Impact AND chemical splash/indirect goggles; must be rated Z87+.